This liquid eyeliner trick requires a steady hand & will make eyes appear wider. 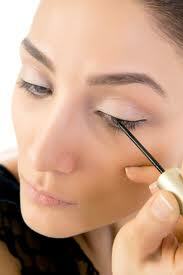 On the upper lashes, dot the liquid liner into the spaces between the lashes, wiggling the liner into the lashes. The result is not supposed to be a line. It’s supposed to look as if the lashes themselves are super thick at the root.